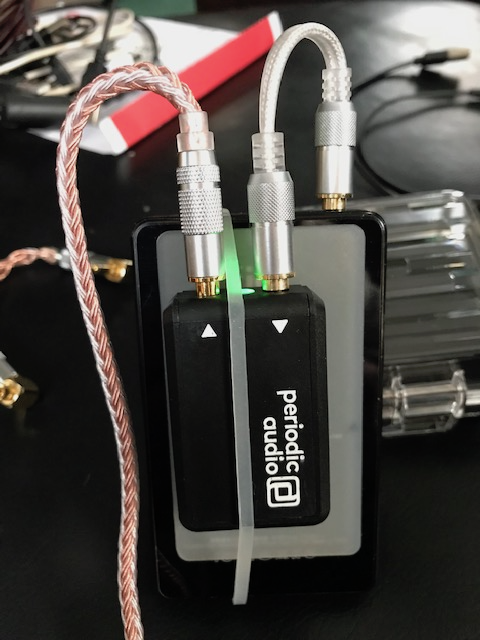 Discussion in 'Portable Headphone Amps' started by DanWiggins, Oct 27, 2018. AudioPhilia.com reviewed the Nickel amp - it's the first "pilot production" unit, so new it doesn't even have final packaging on it (that arrives in a about 12 days). But it is 100% complete - tooled, built, approved. I'm heading to the PCBA fab house in 10 days to oversee the complete build of the entire first production batch. For those who want to geek out about measurements, here are all the AP measurements of a production unit. ALL measurements are made a 90 mV input; with the ~6 dB of gain we have, that is ~180 mV output - about 1 mW into 32 Ohms, so not a "rigged/you'll never use it at that level" type output. Note the full AP report is there, so you can see all the setup criteria we use. The SNR @ 180 mV output is 91 dB; at full output (3 Vrms) that would be an SNR of 115 dB. THD is quite low at less than 0.004% broadband. Oh - and all these measurements are made while sitting directly in the middle of the screen of a Samsung Galaxy Note 8, running Google's Speed Test via 4G on Verizon's network - so this is worst-case, including all RF saturation issues you might encounter. Cables were bone-stock SONOS (I have some extras, from my time working there) RCA-to-3.5mm cables (1 meter long) that they include for free with Connects and such. Those go to RCA-to-BNC adapters then the input of the AP 525. So nothing exotic, nothing fancy, about as unbiased and "typical" as you can find. Pre-orders are open now, we'll have shipments rolling out around the end of the month! I'll do a full 3-4 minute video about the Nickel architecture one of these days, to explain what we did in making this portable powerhouse! Look forward to getting the Nickel either from PA directly (if & when the exchange is favourable for me) or my local distributor when they finally have it in stock. This looks like a neat package. Can't wait to see more about it. Want to give one a trial spin? Would love to get some feedback on how it works... PM me and we can arrange a demo for you! Just have to say, considering the wait on the Nickel, I am more than well pleased, initial impressions wise, on what this little thing can do. I kept forgetting it was so small too. I especially like the 3.5 mm balanced cable which comes with it & the auto on & off. Thanks! I think that a cellphone and a Nickel replaces about 90% of the DAPs on the market (everything but the super-high-res file needs)... And it's a heck of a lot more convenient! Yeah, they're about the size of a 9V battery (Ni is about 32mm x 50mm x 17mm, a 9V battery is around 27mm x 49mm x 18mm). So we're a bit wider than a 9V, a bit thinner, and about the same length. On the plus side, we're about half the weight of a 9V battery (~22 grams versus ~45 grams). So pick up a 9V battery - we're that size, and half the weight. PaganDL and Richsvt like this. Though before I forget, been wanting to ask, @DanWiggins, the 3.5 mm Balanced or Mic Passthrough cable which comes with the Nickel, aside from the obvious using another cable, is there a way to reduce line noise on the Nickel? The third pole doesn't help on sensitive gear for obvious reasons which I didn't think about before as I never had a 'problem' with any balanced 3.5 mm cables & all others work fine with the Nickel. Saying that, I do have a standard 3.5 mm cable which I plugged into the Nickel from what I didn't realise was a sensitive source & it nearly made me deaf...(No one's fault but my own) from the line noise. Note that Nickel will NOT work with balanced headphones! You need both the bottom ring and sleeve to be grounded, but Nickel does NOT drive the sleeve - it's passed through. Not sure about line noise? Is it noise from your source? Is the cable solid, is it pressed in all the way? The connectors we use are tight - they are meant to survive 2500 insertions and still maintain 110% of recommended TRS retention force. That's 5 years, 1.6 insertions per day on average. Make sure they are fully seated and it should work well. We do have a minimal internal gain - 6.5 dB - so it shouldn't get too loud. Yes, regarding line noise, I believe there may be a potential line issue with the head out on my audio interface, Lexicon Alpha, when connected to sensitive head amps &/or sources. So as said, I don't believe it has anything to do with the Nickel per say but said cable. By the way, everything is fully inserted on both ends, connector wise, short of pushing it right through the unit, that is...no this is not a joke. I am well aware of the specs, I have certainly stared long enough at them when waiting for the Nickel to be available. Oh, no problem at all! I really appreciate your feedback, there are literally millions of combinations out there, and it's great to get feedback about particular setups, it helps us figure out how to improve product designs (if possible) or how to increase consumer education initiatives!